A Security Camera by the Sprunk sign in Dukes. Security Cameras are collectibles in Grand Theft Auto: Chinatown Wars. They need to be destroyed to count as collected and can generally only be destroyed using grenades or molotovs. There are one hundred Security Cameras in Liberty City. 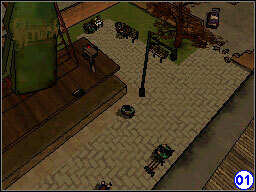 Security Cameras are introduced to the player by Liam in the mission Tricks of the Triad. Locations of destroyed Security Cameras are recorded in the PDA. For each camera destroyed, the player gets a step closer to completion, and the price of drugs gets slightly lower, up to a total decrease of 40%. When the player destroys all 100, they can unlock the drug dealer Sean via the Rockstar Games Social Club, who sells drugs for half their street value. This page was last modified on 19 August 2012, at 21:29.